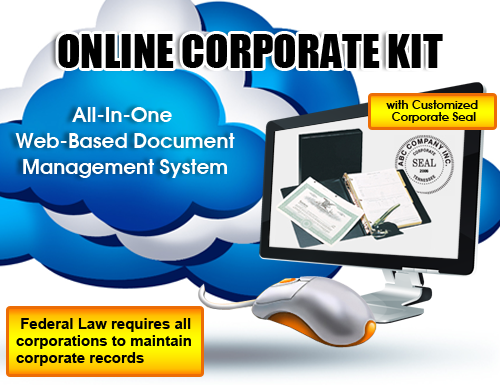 Corporate Minutes Online's web based Corporate Kit keeps your corporation in legal compliance and gives you storage place for all your important business documents. Banks, lenders, accountants, and lawyers often request the documents stored in a kit, so we have provided sections for each, making it easy to organize and retrieve them all. Corporate Minutes Online Corporate Kit also comes with your very own customized Corporate Seal both digitally stamped and blind-embossed with no additional cost.